In the best possible way of course - those daisies can be tricky. 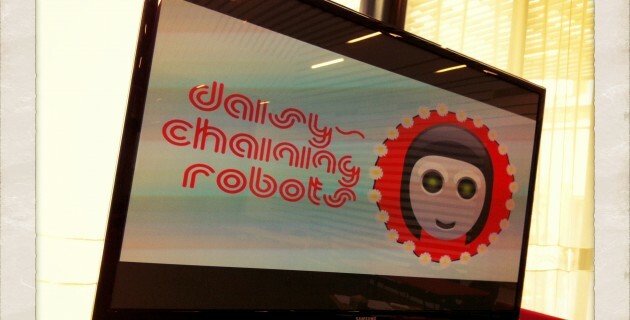 "Daisy-Chaining Robots was a full day masterclass in Social Media for creative businesses, run June 17th at the Art Gallery of Ballarat. What a fabulous day of presentation and discussion about social media, robots, platforms all in the name of developing a good Communications Strategy. Because that's what social media is about, its about narrow-casting and focusing your message to just the people that matter, making them feel special. For many in the arts and in creative businesses and industry, utlising social media is about extending existing skills in communication. It just helps to have a think about it first. Social Media is not mass media though we got some attention there too. Mass Media is about broadcasting and hoping that because it reaches so many that someone may be interested. They called me (Erin - Yum Studio Creative Director) an internet expert. Have no idea what that means, really I'm someone who understands communication. For me the internet is not about technology it is about people, about communicating with people. There were some really fabulous people at the session including Talina Edwards, now local Architect looking to support her work online. And here is the slideshow from the day. We love sharing free platforms and Slideshare is another one of those, however the free account doesn't include the notes... ahhh limitations. Pocket - once 'Read it later', a place to hold the stuff you want to read later! Happy to answer any questions just leave them below as comments. Cheers and thanks for a great day. 4 Responses to "Daisies were Chained"
Great summary and slides, Erin. I’ll be running a similar workshop soon, so I might call on you for some advice. Thanks Erin, it was a truly wonderful & informative day in so many ways. Total pleasure Louise, the discussions and ideas really were rocketing that day, thanks so much for your contribution!